Aaaand after an hour trolling websites I would never been on if it weren’t for the fact that they’re part of this book, I’m actually going back to page 10 or so of the reading experience. Oh, but before I finished the list, there was another link to an actually hilarious tumblr site also set up by “Mags” – DIY in the USA, where people submit photos of questionable patriotic displays. 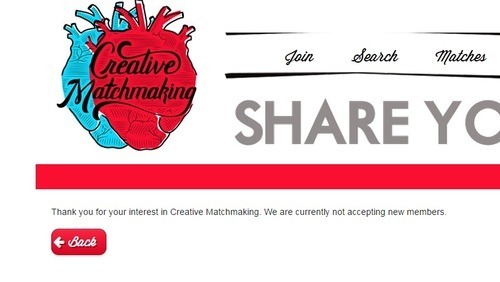 In the next chapter, I was taken to a website called Creative Matchmaking, which I tried to sign up for, because it would be great if a real matchmaking service could come of this book. For creatives, that is. People who really dig the whole “wacky artist” vibe. But alas, the site is not accepting new members at the time. Still, you gotta wonder, who did the author recruit to help her with the videos on the site? Her friends? Professional actors? Whichever they are, they’re amazing. SHARI, wouldn’t you know, is poor Mags’ roommate! I am rather proud of myself for having gone all over her website even before I knew this, just from the comment that was on Mags’ collage blog (also, amusing anecdote, as I write this review a squiggly red line tries to convince me that “collage” is not a word and that I should change it to “college.” This is hilarious because Shari’s own tic that ticks Mags off is that she calls Mags’ collages colleges. So basically, my tablet has decided to side with Shari. My tablet must like her breastiness). Just took my first poll! The question, a burning one, is whether or not Mags should go see her ex boyfriend who’s been dying to talk to her. Hmpf. A few pages later brought me to what this whole book is about, a video of a kind of cute (very Ken-doll) white guy who’s asking the purchasers of his cameras to find him and be his soul mate. But that’s not my favorite thing. My favorite thing so far is the ifckedup.com website, which, like some of the others, I hope will take on a life of its own beyond this novel because the concept is so cool. On the website, Jason apologized publicly (and sets up a platform for others to do so) with up and down votes for each apology, as in, crowdsourcing forgiveness. Though Jason tells Mags that a lot of people think she should forgive him, the current tally I see is 25 to 7 that she should NOT.